So never mind that these three pretties aren't due out until next spring. Let's focus on how awesome they are likely to be and how ecstatic I was to run across their covers. I trust all three of these authors (two of them new-to-me discoveries this year) to come through with beautiful writing and a sophisticated tale. One is a direct sequel, one a companion novel, and one a standalone. All three bode well for 2013. This is the second in the His Fair Assassin trilogy and sequel to the most excellent Grave Mercy. Though I'm not quite as enamored of this cover as I was with the first one, I am no less excited for Sybella's story. And I love the tagline, "Vengeance is divine." You spend most of the first book wondering what in the world is going on with this girl, so it's going to be just very good to find out! At last! A cover! My heart can only stand so much happiness and the release of the long-rumored companion novel to Whitcomb's fabulous A Certain Slant of Light is going to push me pretty close to full capacity. I consider the first book pretty much perfect, and I won't be fit for polite company until I get my hands on Jenny and Billy's story. They deserve a good one. The Statistical Probability of Love at First Sight was something of a sleeper hit for me this year, and so it is with much delight that I anticipate her sophomore novel. I'm eager to delve into her writing again and the Sleepless in Seattle-ish story line puts a smile on my face. I also love the way it will look next to its sib on my shelf. With the matching font, the silhouette, and the bright yellow for contrast. I'm reading Grave Mercy right now and it is SO GOOD. Why did I let some negative reviews scare me away? Overall I like the cover for Sybella's story but something about her face is kind of off...and UNDER THE LIGHT OMG IT HAS A COVER. *hyperventilates* AHHH. Can it be 2013 now please?! I haven't read Jennifer E. Smith's debut but I do like how both books have such cool covers; they'd be good movie posters. Isn't it wonderful? I was enchanted right off the bat. Yeah, I'm SO not going to be able to wait for UNDER THE LIGHT. I mean, Jenny and Billy!! I finished Grave Mercy. Oh. my. god. HOW CAN PEOPLE NOT LIKE IT! It was amazing from start to finish. Sigh. Jenny and Billy were just as intriguing as Helen and James--I can't wait for this book! I have NO idea. It's brilliantly entertaining, IMO. I've got Grave Mercy on my list, and I'm glad to know you enjoyed it. As for Waiting on Wednesday...I feel like half the time I'm jumping for joy at new books, and half the time I'm crying silently at the release dates being a year away. It's a life of suffering we lead, Lizzy. I am excited for all of these. I didn't even know there was going to be a companion to A Certain Slant of Light! I've read books by two of three of these authors. So, I'm glad to see some new books to look forward to. Like you, I'm glad Sybella's story is being told. And Jennifer E. Smith--wow. What a debut book! Yes, there's so much that is unanswered and troubling about Sybella in GRAVE MERCY. Looking forward to finding out more. I really thought tSPoLaFS was such a good debut. You're right, Christina. It does. 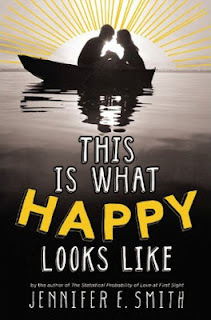 I loved TSPoLaFS and I don't want to miss Jennifer E. Smith's next novel for the world. As for the other two authors I haven't read any of their books but I do have Grave Mercy on my wishlist(a couple of not so great reviews has kept me from buying it). Yeah, I'm so anxious to see what she follows it up with. The premise sounds fun. There did seem to be a mixed reaction to GRAVE MERCY, but for me it was a home run. 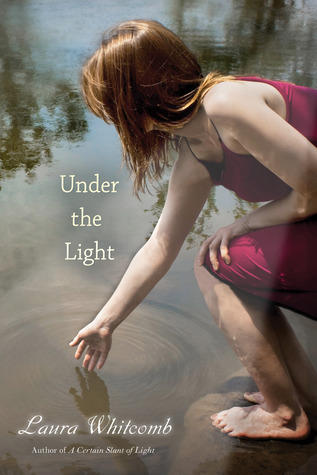 I've been waiting for the sequel to A Certain Slant of Light for years. That book slayed me with the emotion and is one of my all time favorites. So happy for this one! Woot. Oh, man. Me, too, Katie. I was just gone over it. I'm thrilled she's gone back to their story. 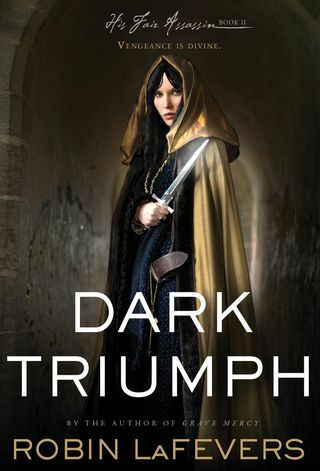 ooo...I'm loving the Dark Triumph cover! It's...well...DARK! Yup. Fits Sybella and the book perfectly, I think. Oh my god. I read A Certain Slant of Light YEAARSS ago and I remember feeling like "Um..more please" at the end! I honestly had no idea there was going to be another! Thank you for informing me! 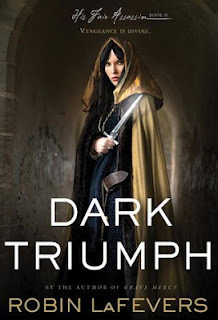 Also I need Dark Triumph now, now, NOW!!! Isn't it the best news ever?! Yeah, April is feeling soooo far away right now. I hated Laura Whitcomb's first book, The Fetch, enough to put me off anything else by her! But I really enjoyed The Statistical Probability... so I definitely want to read more from Smith. I've heard great things about Grave Mercy so I'm planning on reading that one too. I have to check out This is What Happy Looks Like. That looks so good, and if you say her first was a hit, then I REALLY must. :) Thanks for sharing! It does look good, doesn't it Becky? I'm trying to decide which of hers to read next . . . I also loved Statistical Probability of Love at First Sight, but I'm fairly sure that I've read earlier books by this author -- The Comeback Season and You Are Here. Grave Mercy -- can't wait for Sybella's story! Have not read A Certain Slant of Light but I will check it out!